Social media drives sales. Over 70% of B2C marketers say they have acquired new customers through Facebook alone. Social media sales isn’t restricted to consumers either. Business purchasers (real human beings too, after all) engage in many of the same online behaviors when purchasing for work, including online purchasing, consulting their social network for recommendations, and searching from tablets and smartphones. B2B buyers and B2C customers are increasingly online and social buyers. In this two-part series, we’re going to tackle how you can use social media to engage customers and drive sales for your business. Set up your social media to drive sales. If you don’t set up your social media marketing to support the sales process, there’s a good chance it won’t. For social media efforts to drive sales, you must set revenue-related goals. 1. Incorporate a contextually relevant call-to-action. At a minimum, ask for the sale, or ask the customer to take the next step to move forward in the sales funnel by providing relevant information for where they are in their decision process. 2. Send customers to your website, ideally to the purchase page for what they were sent there from based on the content they were on before arriving at your website. The goal is to reduce steps to purchase. 3. Streamline the conversation funnel on your website. Before you drive prospects from your social media sites to your website, ensure that it can effectively convert prospects. Have you eliminated extra steps? Have you reduced distractions that hinder conversion? 4. Answer customer questions via social media. Often, customers have last minute questions before they are willing to commit to a purchase. One great way to answer these questions is via social media. 5. Offer coupons on social media and mobile to get the sale. Regardless of how well you’ve sold your prospect, there’s a good chance that they’ll check their smartphone or social media contacts to determine if there’s coupon or better pricing out there. Therefore, if you’ve been using reduced price offers, make sure that they’re available when customers are ready to buy. To drive sales, you must incorporate this goal into your social media marketing and create relevant metrics that help you track your progress. Integrate appropriate promotional codes, contact history and other tracking methods to capture the relevant information. Social media is where commerce happens. Regardless of the kind of business you have (large or small; B2C or B2B), social media helps create sales. Maximize what the different social media platforms can do the most for your brand based on the kind of business you are. • About 26% of the entire world is on Facebook (2 billion monthly Facebook users, approximately 7.5 billion people on Earth). It’s by far the largest social site. B2C, B2B and Non-profits are on Facebook and rightly so. It’s where your audience already is. • Instagram and Pinterest are visual and idea destinations. For B2C marketers, it’s where consumers go to get ideas before they purchase. • LinkedIn and Slideshare are top social media platforms where businesses turn for information. Ideal social sites for for B2B lead generation and thought leadership. • YouTube is useful for how-to and informational videos (both B2C and B2B). Show your customers how to use your products or services, provide tips and tricks, and troubleshooting common issues. 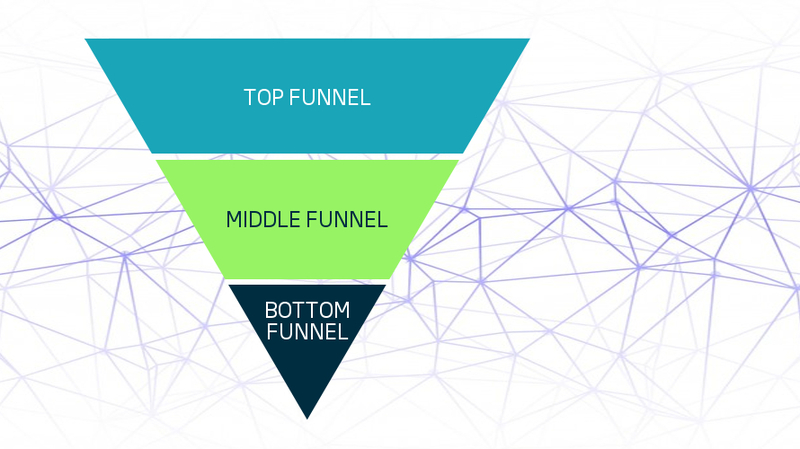 The top of the funnel is where potential customers discover you or are attracted to you through your advertising and marketing efforts. Social media generates leads and sales. Social media helps generate leads through shared content that attracts prospects via as blogs (including website-attached blogs, Tumblr and LinkedIn), text posts, video and photo content on Facebook, Twitter, Pinterest. Social media generally isn’t where sales are closed, but it is where sales leads are generated, where customers do research and discover useful information about purchases they will make, and share that helpful information socially with people they trust. And this is just pure content marketing through social media; out of the scope of this article is the use of highly targeted advertising available through social media platforms (look for social media advertising in another post soon). Consumers seek out businesses on social media. In 2012, two out of five consumers followed retailers on one or more social media platforms. For retailers, social media is the digital real estate you must be on that attracts prospects and customers. You must be on the social media platforms where your prospects turn for shopping information and input from their family and friends. It may be the Age of Web 2.0 (and beyond), but people are still social beings. Our underlying psychology hasn’t changed; the way we acquire information has. The good news is you can proactively use this information to your advantage and help your customers acquire the information they’re looking for where they look for it. We look to others for recommendations, positive or negative feedback on using a product or service, and to get ideas. Social media is a critical aspect of the purchase process, whether social content leads them directly to a site to purchase (bottom of funnel), or if they are beginning to gather information (top of the funnel) or qualifying their decision-making (middle of the funnel). Your social media content should give your customers information and options at all stages of the funnel, and you should be aware of what is being said about your brands and proactively working to shape positive mentions about them. • 68% of consumers use YouTube to browse and research products. • 59% of Pinterest users purchased an item they saw on it. • 33% of Facebook users purchased an item after they saw it on their newsfeed or a friend’s wall (social influence). • 63% of millennials say they stay updated on brands through social networking. • 46% of internet users rely on social media when making purchases online. Check out “Part Two” for more on how you can use social media to help your customers through the Middle and Bottom of the funnel.